Linköping University is Swedish fifth largest university and stands at position 26 among the world’s 50 best young universities in the latest ranking by the prestigious QS World University Rankings. LiU comprises four faculties: Arts and sciences, Educational science, Medicine and the Institute of Technology with 27 000 students, 1 300 research students and 4 000 employees. In only three decades, LiU has become renowned for its innovative educational spirit, for its stated ambition to foster cross disciplinary cooperation, and for its ability to involve in fruitful interaction with surrounding society. Within LiU, the applicants are part of the Faculty of Health Sciences, Department of Clinical and Experimental Medicine, Division of Ophthalmology, and the Technical Faculty, Department of Biomedical Engineering. The Faculty of Medicine and Health Sciences at LiU engages in professional medical and life sciences education as well as a broad range of scientific activities ranging from basic biomedical and experimental clinical research to applied clinical studies and research. The faculty comprises 3500 students at two campuses, grants 50 PhD and 40 M.D. degrees each year, has 70 professors, and has active exchanges with 50 universities in 25 countries. 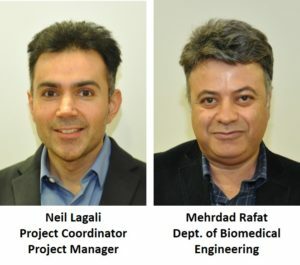 Within the Division of Ophthalmology, the LiU partners are directing the Cornea Research Program, which covers basic science/cell biology, pre-clinical research, clinical research and clinical trials. A long‐standing research program within the Division of Ophthalmology has been the development and validation of implantable, tissue engineered corneas for the regeneration of native corneal tissue. Of specific relevance to ARREST BLINDNESS, the partners in the Ophthalmology have conducted numerous pre-clinical studies implanting tissue engineered corneas in rabbit and pig models, as well as a Phase I first‐in‐man clinical trial in 2007 with results reported in 2012 and 2014. As this project represents a new generation of advanced therapy to address prior deficiencies preventing the widespread adoption of the tissue engineered corneas, the tasks in WP2 will build directly upon prior pre-clinical and human studies carried out by the partners. In addition, the LiU partners have established a leading research centre for In vivo Confocal Microscopy of the Cornea, a state‐of‐the‐art non‐invasive technique for corneal assessment and diagnosis. This competence will be shared with partners in WP4 and WP7. WP1: leader for WP1, responsible for overall legal, contractual, ethical, administrative and financial management of the project, management of risk assessment and quality insurance, reporting, coordinate and monitor WP activities. Dr. Lagali obtained his doctorate at the University of Alberta in Canada in 2000, and has researched and validated tissue‐engineered corneal substitutes for the past 16 years, first in preclinical studies in Canada and later in a first‐in‐man Phase I study in Sweden. Dr. Lagali leads a team of PhDs, postdocs, and clinician‐scientists in the fields of corneal regenerative medicine, ocular angiogenesis, corneal nerves, and in vivo corneal imaging. He has ongoing collaborative studies with research groups throughout the EU and abroad, and has authored over 70 publications in international journals in the field of cornea research. Dr. Lagali has co‐authored 4 book chapters, 1 book, and holds 7 patents in the fields of optical devices and diagnostics for the eye. He is a frequent speaker and symposium organizer at international ophthalmology conferences and has over 50 invited conference presentations. He is Associate Editor for Current Eye Research, Acta Ophthalmologica and Heliyon. Dr. Lagali has received research funding from the Canadian Institutes for Health Research, the Swedish Research Council and the Marie Curie Program under FP7, as well as funding from several pharmaceutical companies. Within Horizon 2020, Dr. Lagali has received funding for ARREST BLINDNESS and COST Action 18116 ANIRIDIA-NET, was Working Group Leader for Bioscaffolds in COST Action BM1302, and is Work Package Leader in the Marie Curie RISE Network 3D-NEONET. Dr. Rafat obtained his doctorate in Chemical and Biological Engineering at the University of Ottawa, Canada, in 2008 with specialization in Biomaterials and Tissue Engineering. He is currently leading Biomaterials research and development in the Department of Biomedical Engineering at LiU, where his research focuses on the use of tissue‐engineered natural material‐based scaffolds for implantation in ophthalmic and cardiovascular applications. He holds four patents and two EUFP7 Marie Curie grants.